June 2, 2017, 10:50 PM · When Shmuel Ashkenasi advises you to fix something about your violin playing, you'd better do it. Though his body language was casual and he spoke in a straightforward and amiable tone of voice, Ashkenasi was a complete stickler, like the cop who will give you a speeding ticket for going five miles over the speed limit -- and then give you another ticket a block later when you fail to come to a full stop at the stop sign. The good news is that you're not going to keep up with those traffic offenses for long, with that kind of oversight. 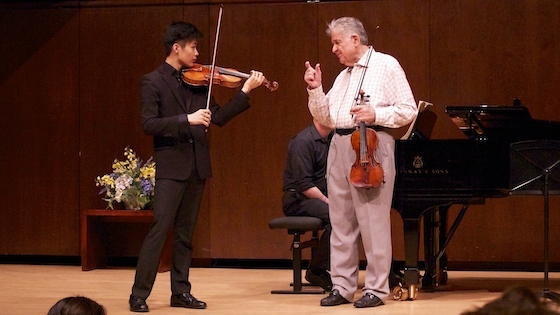 When you are doing something wrong in your playing, "be offended," Ashkenasi said several times to different students at a master class Friday at the Starling-DeLay Symposium on Violin Studies at The Juilliard School. "Let it bother you. Then you will take care of it." Born in Israel, Ashkenasi studied with Ilona Feher and Efrem Zimbalist and was first violinist of the Vermeer Quartet for nearly 40 years. He is currently a member of the faculty at the Curtis Institute of Music and also teaches at Bard College. Student artist Takumi Taguchi began the master class with an impressive performance of the first movement of the Sibelius Violin Concerto, in which he brought out the intricacies of fast passages and showed clarity of rhythm even in the murkiest of parts of this piece. Ashkenasi praised Takumi's playing and then said that while he saw many good things, he was going to focus only on what needs changing, since they had limited time. For Takumi, Ashkenasi's primary concern was choice of score. "I urge you to use as good an edition as possible -- because so many things that you did were not written by Sibelius," Ashkenasi said. "Try to be faithful to what he wrote," he said. 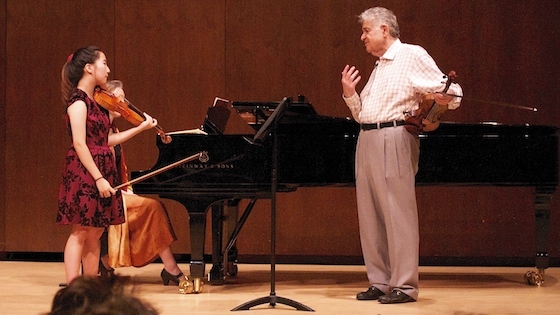 He advised that if you have a bad edition, try looking at the piano part or orchestral score, which often has an unedited version of the solo violin part. What kinds of things are in that score? First of all, the very first entrance for the solo violin -- Sibelius marked it "mezzo forte." "Everybody wants to be super-delicate, but it's not what he wrote." Ashkenasi also talked about an intonation phenomenon that happens in fast passages: you sometimes need to play them out of tune to make them sound in tune. For example, half steps need to be very close and whole steps need to be far. "If you do it slowly, it will sound out of tune, but fast, it's okay," Ashkenasi said. "When you play fast, it needs to be different." Another example: if you are trilling a whole step, it needs to be played sharp in order to sound correct, he said. He pointed to another idea for Takumi to work on: avoid artificially pulling the bow, which gives each note an accidental swell. "This problem is not severe for you, but it's going to grow like a monster," Ashkenasi warned. "It's a cancer of string playing." And as with cancer, "if they leave any cells, it is going to grow again -- you have to eradicate it." Accenting each note seemed to help Takumi each time that he fell back into the habit. As Takumi focused on changing one thing, often another issue creep in; and Ashkenasi never failed to take note. "You were not vibrating the A," he said. "It's not a crime, but it's not beautiful. If you had a less beautiful sound to begin with, it would be less offensive." And as Takumi was fixing the vibrato problem he found himself caught again in playing something that wasn't in the score. While playing that, Ashkenasi observed that "even the open G will sound better if you vibrate." In the end, Takumi was doing a lot more vibrato -- I imagine he's also ready to find a new edition of the Sibelius! Next Maya Anjali Buchanan played the first movement of Brahms Sonata No. 1 in G.
The piece is marked "con anime," which doesn't not mean "with animation," as some might guess. Instead, Ashkenasi said that it means "with soul," or heart or feeling. He wanted the development a little slower. "When Brahms writes a swell, it most often means vibrato -- that is peculiar to Brahms," Ashkenasi said. He didn't like her strumming some chords in a place where the violin is harmonizing the piano part. Instead, he recommended using two right-hand fingers to pluck the notes in unison. He felt that her tempo was not matching that of the pianist's and advised that she "play it once with a metronome. Maybe five times." And just for the sake of practice, "Try to be unmusically correct." And apart from becoming more solid with the rhythm, occasionally you simply just go with the pianist, even if it is a bit faster. I was not able to stay for the entire class, but the last student I saw was Jiyee Ahn, who played the third movement of the Tchaikovsky Concerto. The opening of this movement is a place where many performers take time and do some rubato playing -- speeding up here and slowing down there. Jiyee's rubato went a bit beyond that, though, with some groups of notes that were too fast to be heard and some that were simply rhythmically distorted. "If you don't have a metronome, get one," Ashkenasi told Jiyee, when she finished playing. "I love freedom, but I hate distortion," he said. "Distortion, for me, is playing in a way that should have been written differently. The beginning of the piece was a good case in point. "He wrote it a certain way, and you totally ignored it," Ashkenasi said. "Great artists are able to be both free and rhythmic -- you are just free. If we allowed that on the highway we would have fatalities." "We need to be faithful to the composer, even when it's Tchaikovsky and not Bach," Ashkenasi said. "Play it with a metronome, so that you know what is there." He had her slow down the beginning considerably to simply count the beats, and she needed a little help in adding back the two beats that had been dropped. Once she understood and restored those missing beats, she made a lot of progress on that opening, in a short period of time. June 3, 2017 at 12:59 PM · Any idea which edition of Sibelius Takumi was using? June 3, 2017 at 07:29 PM · He also teaches at Northwestern University! June 4, 2017 at 04:02 AM · I'm not sure what version he was using! I was working off the Francescatti Edition from IMC, but I will look over the piano part and orchestral score again. I enjoyed the masterclass very much and also appreciate all the concise summaries that Ms. Niles writes throughout the week! June 4, 2017 at 09:07 PM · I really like this description of what I might believe was a perfect master class! All the suggestions were so genuinely helpful, and seemed wonderfully wise and generous. Thanks for bringing this to your fortunate readers! June 5, 2017 at 12:08 PM · Thanks, Takumi! Congratulations to you and to all of the performers, and let me add my thanks to Laurie Niles for her articles. June 5, 2017 at 07:29 PM · great quotes, superb coverage -- Thanks, Laurie! June 6, 2017 at 04:36 AM · Whatever faults the Francescatti edition may have, omitting the "mf dolce ed espressivo" marking at the soloist's 1st entrance is not one of them. I think it is easy for someone to listen to the very quiet murmuring of the strings and be misled into thinking that it should be a similar effect in the solo part. But with all due deference to Mr. Ashkenasi, Ms. Chase would probably agree that the mf is as much a character marking as a volume indication, and two violinists looking at the same marking might well have two very different results which nonetheless respect the composer's indication. June 9, 2017 at 06:40 PM · The coverage was indeed great Laurie! Thank you!